Blackjack Table Layout from Blackjack-Guru.com - the guru knows it all! The Blackjack-Guru is back! This time I�m going to give you all the ins and outs about the blackjack table layout. I�ve seen my share of casinos in my day, and have see lots of different types of blackjack tables, but they�re all really pretty similar. There might be a different color of felt, or circles instead of squares, but it�s all the same in the end. All you need to know is when to stand and when to hit. The rest is up to Lady Luck. First of all, below, you can see a photo of a fairly typical blackjack table. On the right hand side is the shoe (discussed a little later) and on the left is the currency slot, in case you�d like to convert your cash into chips. The chips are given out to players from the chip rack, located in the centre at the back of the table where the dealer stands. When placing a bet, each player would place their chips in the square that corresponds to their position at the table. Simple, right? 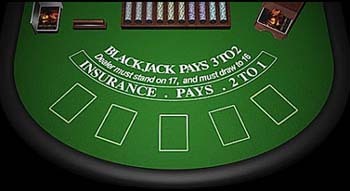 The blackjack table in a casino is set up with five to seven betting spots, shown by either a circle or a square, and that shows the maximum number of people allowed to play at that table. There is always one dealer present at a blackjack table, who collects losing bets or pays off the winners. The seat that is the farthest to the right (the dealer�s left) is referred to as first base and the deals flow in a clockwise direction to the last seat, called third base. The dealer stands opposite the players and in front of the chip rack, which holds all the chips that the blackjack table has available. If this table uses more than two decks of cards at a time, you�ll see the �shoe� at the table. This box is used to hold the un-dealt cards, and the dealer slides each card out of the shoe as it is dealt. The currency slot, as it�s called at the blackjack table, contains the money that has been used to buy chips. You may have seen this in a movie, where the player slaps down a few hundred dollars, and the dealer gives him his chips, then pushes the money down through the slot with a long thin thing like a spatula without a handle. This is done so all the players can see that the money isn�t being handled directly, and that it�s safely tucked away. Once you�ve started to learn, you�ll see that the rules that apply to that particular blackjack table in that particular casino are written right on the table. You can see in the photo. This is really helpful to the new player as well as the pro, because you can choose the type of table that you want to play at. I hope all this has been a help to you, and you now feel comfortable going out to the casinos, and joining in the fun at the blackjack table!